The dust hasn’t even settled from the events of the first film when Chapter 2 kicks in. John’s little murder spree has consequences, and local crime boss Santino D’Antonio (Riccardo Scamarcio) calls in a favour, requiring John to murder even more people in the face. The performances are…middling. Keanu does his usual thing – 50% great, 50% awful, depending on the line – whilst Common impresses the most as another assassin. Ian McShane could play this role with his eyes closed whilst Riccardo Scamarcio is a good mix of smarmy and deadly serious. 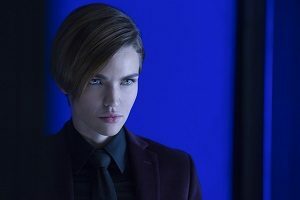 I spent a lot of the film so ready for Ruby Rose to kick some arse, but unfortunately was left disappointed. The action is fine. No, actually, that’s not fair – it’s great. I can see why people like this: wide shots, locked-down camera, long takes. But the problem is Chapter 2 has nothing going for it when it comes to escalation – once you’ve seen the first fight in this movie, you’ve seen it all. Once or twice a potentially cool gimmick raises its head, only to be swept under the rug in favour of more punch-grapple-shoot-in-the-head moments. I’m okay with a simplistic plot and endless action scenes, as long as a filmmaker ensures there’s some kind of intensification. Aside from some skilful, if dull, choreography and some great cinematography, John Wick Chapter 2 is a big disappointment.